Imagine all this in a Southern Accent: Alright then...Behind the ears...Same way now...Best one yet.. oohhooooo!!!! was probably my favorite. These words echoed across the room as Coach Ray Jones cued and encouraged his weightlifters to make the next lift even better than the last. I had the awesome opportunity to be a part of this incredible experience. Let us take a step back... I am far from your best weightlifter. I love the sport of weightlifting and just happy I can participate in it. As a matter of fact, I am your Everyday Lifter. My training has been inconsistent due to traveling and working and I decided to commit more time for it, no matter where I travel to. "So, what do you think about getting a training session in with Ray?" That's what Ryan, (CEO of LiftingLife) said to me after I told him I needed to set time aside to get to a gym. Without hesitation, I jumped on the opportunity. Actually, I put Ryan on mute, laughed nervously and giggled. Like seriously, how could I have said no?!! Nervous at first because I arrived 15 mins late. I quickly got to warming up. Everyone was focused, minimal talking and all just ready to train! If you've ever watched a great training session with focused weightlifters, the room gets a rhythmic feel to it. Everyone knows when to take their turn and there is a tempo in the room. Within minutes you can feel Ray's presence in the room. He is with you for every-single-lift. He stands mostly in the front, walking back and forth with a PVC pipe in hand. The scene mimics that of a conductor at an orchestra. With every attempt there is a celebration and just enough feedback to not overwhelm the weightlifter. His voice booms but not in an intimidating way or too cheerleader like either. He is enthusiastic about all your attempts because they are important to him. Ray's voice is authoritative, confident and it's contagious. You too start to feel the same way with your barbell. He almost becomes your voice in your head when you start to over think. His words and enthusiasm overpower any negativity that can distract you from your lifts. You can't help but smile when training. After I left, naturally I had a few questions. Alright fine... I had like a million questions but kept my excitement contained to 3 questions. I wanted to know more about how he got started, the beginning of coaching for him and what is in stored for the future Coach Ray Jones. "In the early 70s I was introduced to weightlifting at David Jones and John Coffee‘s gym in Eastman, Georgia, been “under the influence” since. Being a coach never entered my mind, it was a natural progression from a lifter with modest talent, to gradually developing into coaching .... fast forward to now, 37 years later, still trying to decipher this sport I love. I learned to approach coaching through my 45 years of experience - encompassing weightlifting - as lifter/coach, striving for the growth of the athlete, never losing sight of the individual. I observe my lifters’ strengths and weaknesses, all the while praising their strengths and elevating their weaknesses." Did you know you too can have Coach Ray Jones by your side? If you haven't heard, he is offering awesome opportunities for both coaches and weightlifters. 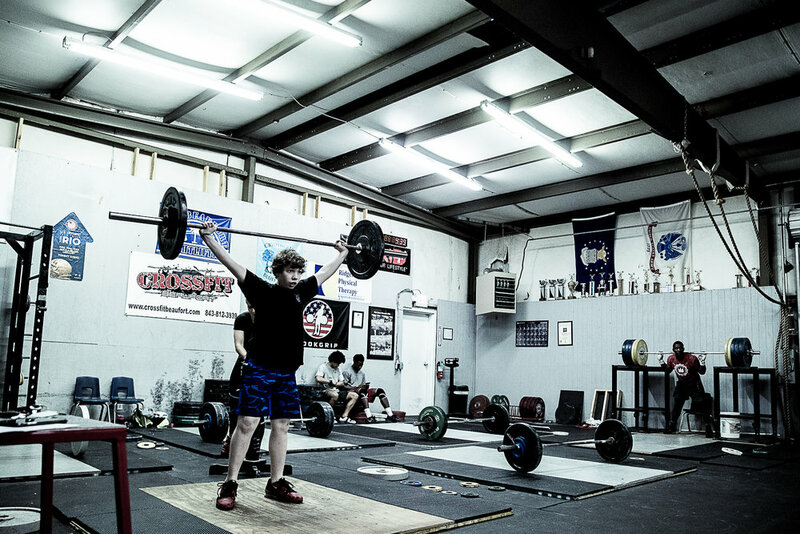 The training camps are open to not only elite weightlifters, but all, be it novice, youth, open, masters. Before you leave, check out his website to find out more about Coach Mentorship, Training Camp and individualized programming. Photos taken by Ryan Paiva and Edited by Viviana Podhaiski.